The late 2014 model Mac mini 3.0 GHz Desktop Computer from Apple is a compact form factor desktop solution for consumers who are dedicated to the look and feel of Apple brand mini computers. The small square desktops contain a 3.0 GHz Intel Core i7 dual core Haswell processor, 16GB of 1600 MHz LPDDR3 RAM and a 2TB Fusion Drive. Although these units require an optional monitor, they are powered by integrated Intel Iris Graphics. These mini computers also support dual monitor displays at 2560 x 1600 pixels. The Mac mini comes with a dual-core 4th-gen Haswell 3.0 GHz Intel Core i7 processor. The processor can also be overclocked up to 3.5 GHz, thanks to Intel Turbo Boost technology. The RAM is soldered on and is not user replaceable. 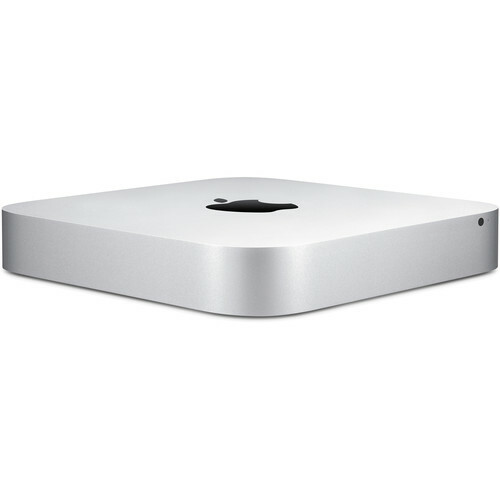 Box Dimensions (LxWxH) 10.4 x 10.3 x 4.5"
Mac mini 3.0 GHz Desktop Computer (Late 2014) is rated 4.5 out of 5 by 10. Rated 5 out of 5 by Frank J. from Glad I made the switch I've only recently made the switch to Mac after years of using an optimized PC for music production (Carillon). The PC had run strong since about 2002 and when it came time to replace it I realized that a Mac Mini was more powerful than the current optimized PCs in its price range and beyond. I'd been reluctant to make the switch because I'd had very limited experience with Macs. I took a leap of faith and WOW! I can't believe how smooth, fast, and EASY everything is. I'm used to configuring just about everything with my PC and with Mac it's generally plug and play. Everything seems much more intuitive. Time will tell on reliability but if my research is correct there shouldn't be many problems there. Great unit and I recommended it for anyone who wants an affordable solution for a home studio. Rated 4 out of 5 by PuppyDoc from Can't go wrong with a Mac Overall I think the Mac Mini is a great little machine but I sent it back because it does have some flaws I couldn't live with... For example, I had to reboot every morning. I was using it for work and I like that my other Macs (2 prior Macbook Pros) would be left on all the time and never require rebooting. For some reason, the Mac Mini would lose connection with the magic mouse and keyboard until a reboot was done. I also like the refresh rate of the thunderbolt connection but the Mac Mini only connects to HDMI for the primary video connection... Do I really notice a difference? Don't know but psychologically, I will always question it. All the reviews scream buy an iMac for speed and power performance but I honestly can say the Mac Mini could hold it's own just fine. The reviews all compare the entry level Mac Mini to the big iMac powerhouse. If you have a good monitor, mouse and keyboard, the Mac Mini is a great little machine. Rated 5 out of 5 by TRVphoto from SUPER! Was not in stock at the @.WAS in stock at B&H...for LESS!No complaints about speed or processing power for photographic purposes. Rated 5 out of 5 by John from Got What I Need Now I have an older Mac Mini and needed to update. Although there will probably be an updated version within a year, I decided to update now. I use the Mini for routine daily tasks such as E-mail, word processing, spreadsheets, and other tasks that do not require high-power computing. The current version of the Mac Mini matches my needs and does all I need it to do. Rated 5 out of 5 by Jose from Apple Mac mini 3.0 Don't get fooled by the name Mini. This is beast. To me this Is better than most of the IMac's systems, specially when you max out to 2TB fusion drive which in terms of speed is great and 16 ram. I bought this system mainly for music. I have the Mac pro tower (2013 new cylinder version) and I feel this Mac Mini go neck and neck with the tower. The tower is great don't get me wrong but I make the mistake of getting the 250 GB of flash storage and although I have an external hard drive, it comes to a point when it is going to be full in no time. That's why I went for this Mac mini and I couldn't be happier. I have a library of virtual instruments and plug-in which already occupying 50 GB and this machine moves like there is nothing there installed. The connectivity with usb and thunderbolts it is a great choice to have without having the need to buy an external piece to connect peripherals. I don't think Apple will do anything in this price range anymore. Specially when they are removing more and features from their devices and computers. This is a great system. Rated 5 out of 5 by MD from Great basic computer I love my Mac Mini.? It was easy to connect up with my keyboard, mouse, and display, and it works perfectly.? I also love the small size.? I chose it because I have many computer related items on my editing desk already and needed something that was small and had a lot of ports.? I got the more expensive version with 16 GB of memory, a 3GHz intel Corei7, and 2 TB of storage (fusion).? It is really fast. Rated 1 out of 5 by Phillips from Probably an unfair review but I HATE IT!!! Let me first start by saying I'm a mac guy. I've gone back and forth between PC's and Macs for years but over the last few years have been converting most of my hardware over to Apple for a variety of reasons. I have 3 macbooks, 2 imacs, an ipad and 4 iphones at my house. Being the "support guy" for my aging parents I've decided to move them over to Apple as well because PC's are buggy if they are not maintained. Got my mom a macbook and when my dad's PC was going out decided to get him this high performing Mac Mini along with a TimeCapsule. Within the first few days the MacMini I received has issues with the HDMI port not sending a signal (black screen) and I've read this has been an issue. It is not in issue with the sleep mode but something with the HDMI data. I also tried the thunderbolt conversion to HDMI but no dice. I opened a support ticket with Apple who verified they couldn't fix over the phone. They asked me to take it to an Apple store 30 minutes away for an appointment that was 4-5 days later. I told the person that wouldn't fly because my dad couldn't be without a computer that long (he still runs a business from his home office). Apple support then said I could walk into the Apple store as a first come first serve basis. I made the drive but they were so busy they told me I would have to come back 6 hours later (which I couldn't stay for as a I already left work to go there). I begged the kid in front to just look at the machine which he did. He tried plugging it in and confirmed it indeed had an issue with the HDMI. So I was left needing to still make an appointment a week later for the Genius Bar to look at and had to walk out with my bad mini. Still waiting for the appointment which I already know will require them sending out and needless to say getting an earful from pops wishing I would have never switched him over. As the headline states, probably an unfair review but anyone who has had this sort of experience with a brand new, high priced machine, can understand the frustration. Had Apple been able to fit me in appropriately would have made this situation a lot better. Rated 5 out of 5 by MYK the Novice from Excellent Product, would purchase again through B&H Ma ini PROS: Small size; easy transfer of information from old Mac computer; fast and excellent performance. CONS: None that I can see. B&H Photo Website PROS: Easy to navigate, all products came as promised, quick delivery, EXCEPTIONAL Customer Service, WOULD HIGHLY RECOMMEND USING this company to family and friends. CONS- NONE!!!! Hello. So apparently the monitor and keyboard don't need to be Mac, based on what I've read in the comments, but can any mouse work or do I need the apple magic mouse? Any USB mouse from any brand. For the monitor, it can be any with HDMI, or with the right adapter, it can be just about any kind. On the 2TB GB Fusion Drive what is the capacity of SSD that comes with it, please? Is this configuration good enough to run Lightroom and Photoshop smoothly? I wouldn't recommend it. Please also be aware, you can no longer add memory to these machines. The bottom cover is no longer removable. If you buy it with 4G RAM, that's what you have, same for the hard drive. You cannot replace the hard drive, there are no user serviceable parts in the machine. All storage and memory is on board.